Another good video. Hyperborea in North America: Ancient Coast Lines and lost history. Good to see Novusod's research in there. There is a lot of information packed into this image. This is from "Fleming et al. 1998, Fleming 2000, & Milne et al. 2005." Each color dot represents a different location, as labeled. 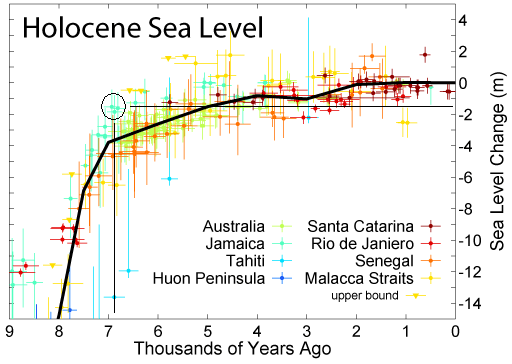 The "X" axis represent time, going back thousands of years, while the "Y" axis represents sea levels. The black line looks like the plotted average based on the data from the individual locations that are color-coded. Where the colored dots deviate significantly from the black line, that could indicate at least a couple of different things. For me, the first thing it brings to mind is how much of this type of science is built upon assumptions that could be easily overturned, as far as dating things, particularly via carbon dating. But also it could indicate that along with great changes in sea level, there may have been massive geological shifts in the past few thousand years, with some areas being abruptly raised high above sea level, and other areas sunk beneath the waves, independent of the rising sea levels themselves. The more accurately the above chart conforms to reality, the more it means that anyone living in these areas would have been subject to massive and catastrophic seismic upheavals, aside from the rising sea levels. This graph is also used as a reference to date sites based on their depth underwater. Unfortunately we don't have the same convenience for ancient sites on land. Here is the result of the Remote viewing experiment on the canals in Florida. This could be a real confirmation as to how the disaster happened to the Earth and a giving validity to Sylvie’s Survivor Series. Remote Viewing the Ancient Florida Canals and Ports of a Mysterious Ancient Civilisation with Arvari remote viewer (probablefuture.com) with 15 years experience and Mark (loononahill.com), and a couple of others mentioned in the video. "Remote Viewing the Ancient Florida Canals and Ports of a Mysterious Civilisation"
Fantastic Video Ellen, Thanks! I've flown over those waterways many times, and family lives practically on one, and (as ridiculous as it seems) just kinda always had an awareness that they were deliberately built. Very Intriguing! Thank You! I appreciate your feedback with your keen observation, EL_O_EL. Part 45 Are there any live survivors of the old advanced civilisation of Atlantis? Here Sylvie is musing if there indeed are survivors of Atlantis and showing that there are people living in seclusion in Russia. She doesn't believe that Vladimir Megre's books are more than stories, but there are people there like her, etc. etc. Last edited by Elen, 15th May 2017 at 17:47. The Ringing Ceders, just stories, interesting imo indeed, mind you in my experience not just logical people sometimes have just stories feelings but also some very goddess types, which surprised me at the time, definitely an each to their own experience. Last edited by Elen, 15th May 2017 at 17:48. Any Flat Earthers here? Duck! To me it defies all logic, based on my own observations, and I have looked into it as well. I.e. I don't believe in a flat Earth, either. Sylvie is allowing comments and someone said EXACTLY what I have been thinking "Just tell these idiots two words.... rain drops. All mass forms a sphere naturally." I am not sure why we didn't though hehe. I know someone who actually has fallen off the edge of the flat earth theory (hehe). It is impossible to talk to him about it and I am flummoxed. There is someone who's videos I used to watch who has become a flat earther (Santos Bonachi). This is THE strangest obsession I have ever seen. This is Sylvie’s 3rd interview so far. I believe there will be many more. And she says this is a good start for the ones that have just started looking into her work. At the end it was suggested an interview with Anatoly Fomenko about the new Chronology, which would be really interesting. She has abbreviated this interview as well (Not much), so the full version is here. I didn't want to derail the Data Libraries thread so I'm posting this here, since it relates to Fomenko and thereby Sylvie's work. the world rulers in old centuries. I was reading a copy of Josephus' history of the Jewish Wars from 1492, which probably makes it amongst the oldest copies remaining in existence. It's in a beautiful form of archaic French that has eſtoit in place of modern était ("was"), and a lot of other variations more similar to Latin, but also little medieval shorthand symbols and markings to indicate abbreviated words. A line over a vowel indicates a removed 'n' or 'm', as in dōt representing dont. It's a text that's supposed to be about a war in Judea around 164 BC, but it shows knights in medieval armor and a cannon. The conventional explanation is either that the artist was ignorant or else catering to the readership of his time, but Fomenko's position on these types of issues is that no, the artwork is correct for the period of the content and the attributed chronology is what is wrong and has been misconstrued and covered up since the 1500's. The book above dates to 1492. On some of these old documents hosted by the NYPL, when you zoom in you can see the detail of the leather skin the pages are made of. Last edited by bsbray, 13th January 2016 at 22:01. I enjoyed this interview with Sylvie, I like the way her research is evolving and gaining recognition. I know there is more new & interesting information to come from Sylvie and I am enjoying the journey. More Remote Viewing results. This time it’s from Mount Nemrut in Turkey and it was done by ARVARI, the remote viewer with a lot of experience. She talks about the importance of Astrological constellations as an accurate way of dating, because calendars can change the Chronology from time to time. Interesting to see the results from this particular remote viewing.